Hiker Mike is the Alter Ego of Actor/Broadcaster Mike Kirby, Station Voice of Home and Garden television and numerous commercials and documentaries. During the three years that Mike lived on The Bruce Trail with his family and faithful companion, Rupert the Malamute dog, the fanciful character of Hiker Mike emerged fullgrown from the Great Eastern Deciduous Forest while hiking through the uncharted trails high atop the Niagara Escarpment. Hiker Mike personifies a happy, positive and optimistic outlook for the future. He is full of the joy of life, and takes great pleasure with the marriage of urban energy to the serenity of nature with his inner city hikes through Toronto's green places. 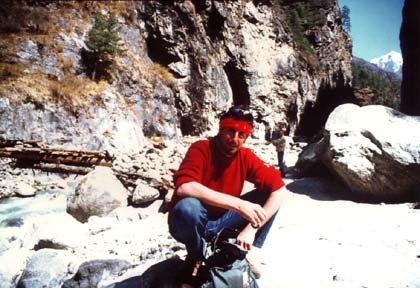 Possessing a wild sense of adventure and a guerilla-like approach to hiking (hiking restricted areas) Hiker Mike has trekked globally throughout Canada, Mexico, Central America, Trinidad, Tobago and the Himalayas, recently walking from Katmandu all the way up to the base camp on Mt. Everest. When CFRB Program Director Bob Mackowycz found out about Hiker Mike and his hardy band of trekkers called the Urban Sherpas, he asked the Hiker to report from the trail to the Weekend Show with John Donabie and share his dance with Mother Nature. Mike has been working with Hike Ontario president Peter Heinz to increase public awareness of the Toronto inner city hiking trails and to promote hiking as part of a fitness lifestyle. As Boomers age, the more exhaustive sports of tennis and running have become less attractive, leaving hiking to fill the gap in a more benevolent way. The Urban Sherpas are a loose group of keen hikers who often accompany Hiker Mike on his adventures at home and away. We will be introducing these folks to you as we get along with this website and occasionally we might get an opinion from any one of them on a favourite hike or valued tool or item of clothing etc. Watch here for more. Hiking is Mother Nature's path of least resistance. It's good for stress and worry. Got a big exam coming up? Or a big meeting? Take a hike for an hour or two with no distractions, and the blood pumping through your brain will bring your thoughts into focus. If I've got a problem to solve, I hit the trail and work it out. I finally found out how to lose that extra tire I've been carrying around my middle. Every night after dinner, during that TV and reading time I normally use for chips, cookies and popcorn, I go for a two hour hike before bed. When I come home I have an orange or a bowl of cereal before turning in and I'm easily losing 5-10 pounds a month. This translates into an inch off the belt every month so we can be skinny and beautiful in time to pig out during the Christmas Party Season. There are a whole whack of Boomers out there who don't want to play tennis anymore and the old 10 kilometre/marathon runner has damaged the hips, back, knees and ankles so bad that running has become painful. So hiking is the natural antedote to killing yourself. No pain, just lot's of gain. Hike Ontario is looking for hike leaders in your area. Hike Leadership training courses are held at Humber and Seneca Colleges, and the courses are quite inexpensive if you're a Hike Ontario member. So call my hiking pal Peter Heinz at 416-426-7362 to join. Now you can get up off your big fat bum and lose it somewhere on the trail with a nightly hike after dinner. Put your boots to it!